This year’s International Women’s Day commemoration was about sharing the vision of getting to equality by the year 2030 and celebrating the partnerships that we have and are building to sustain this work. And of course some physical activity! In collaboration with the National Sports Council of Zambia (NSCZ) we held two (2) hours of aerobics sessions on 7th March to promote physically active lifestyles. The sessions were provided free of charge to all and we had about 200 women, men, boys and girls participating and experiencing the joy of movement. Our partner Standard Chartered Bank (SCB) held a Women’s Day celebration event at their London office on 8th March. The event was hosted by the SCB Women’s Network and our International Adviser Ms. Lombe Mwambwa was one of the Guest Speakers. She shared with the staff present what the Goal Program is about in Zambia, the influences it has on girls’ lives and the community. The Bank’s Group CEO Mr. Bill Winters opened the event and spoke of the Banks commitment to achieving parity, within the Bank and by supporting programs such as Goal. The other guest speaker was Ms. Ebony Rainford-Brent who was the first black woman to play Cricket for England, winning the Ashes and the World Cup, she spoke of the power of sport to provide opportunity and positive life experiences and choices. Standard Chartered Bank supports us through Women Win to deliver Goal, this year we are reaching 2,500 girls and young women with sport and life skills. 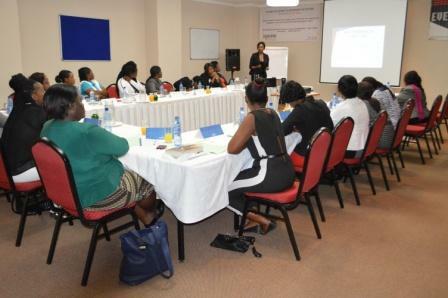 The Working Group of the Women Sport Africa Network (WSA) held it’s second meeting in Uganda on 9th – 10th March 2016 to move forward the effort to build an Africa wide network of women in sport. The Working Group is chaired by NOWSPAR founder and Executive Director Ms. Matilda Mwaba in her capacity as Africa Representative to the International Working Group on Women and Sport (IWG). The Women Sport Africa Network is supported by the IWG and will be hosting an Africa, Women and Sport Conference in October this year. The Women in Sport Leadership Network Seminar with the theme: Determine the Change. Be Part of the Change was held on 5th June 2015 at the Protea Arcades Hotel. The Seminar covered three key issues the results of our leadership survey, discussions on leadership ambitions and the International Working Group on Women and Sport (IWG). The Seminar theme is adopted from the IWG 2014 – 2018 theme in order to promote the aims of the IWG to advance principles of the Briton + Helsinki Declaration and the resolution to motivate collective action of women in sport at Continental level. The 20 participants of the seminar were leaders from sport Associations and Clubs, University Students, Media and Health practitioners. The meeting was started off with welcome speech by NOWSPAR General Secretary, Ms. Lombe Mwambwa. The Executive Director of NOWSPAR, Ms. Matilda Mwaba explained about the Women in Sports Leadership Network as the second speaker. She encouraged the members to continue inspiring and motivating other women in their respective organizations by sharing what the network is doing with them. NOWSPAR Project Assistant Ms. Aya Noguchi presented the She Leads Survey 2015. This survey has been conducted by NOWSPAR since 2010 to track the number of females who are in decision-making position in sports. This data has also been contributed to the IWG Sydney Scoreboard that tracks participation of women sport leaders across the world. Ms. Changu Siwawa who is the IWG Resource Mobilization Manager explained about IWG and IWG International Conference. IWG, International Working Group on Women and Sports, started in 1994 and the first conference was held in the United Kingdom (UK). In the session on Career ambitions, individual participants had time to think about their individual next 2 years career plan and share them with fellow participants. Everybody had unique and strong ambitions in their own fields. Following discussions, some some members were able to find potential partners who can motivate and support each other to achieve their own goals. 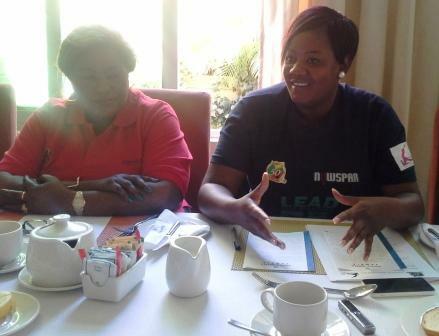 NOWSPAR Executive Director Ms. Mwaba thanked the member for attending the important meeting in the closing. She further mentioned of the vacant Positions on the Board of the National Sports Council Zambia and encourage the women to contest the election. delegates which will be consisted of 400 from the hosting country Botswana, 500 from other African countries and 300 from rest of the world. 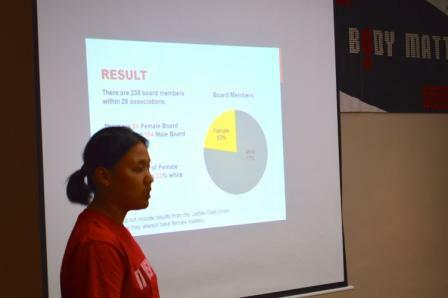 The Seminar participants resolved to mobilise as many women in sport as possible to participate in the Conference. It was also an opportunity for her to explain how she is working with the IWG through NOWSPAR as African representative. NOWSPAR has done oral and poster presentations at IWG International Conferences in 2010 in Sydney and 2014 in Helsinki. Lastly she thanked Miss Changu Siwawa for coming to the meeting and adding more value by her presentation and discussion. Also she mentioned that this coming August, the IWG Co-Chair will be visiting Zambia. At the Seminar members shared the events that their organisations are having including the Fundraising Dinner Gala by the Handball Association. Opportunities for media coverage and public engagement and information on Diabetes. Please see more images of our Seminar here. The Network hosts quarterly activities, last quarter Network members participated in the Women’s Sports Day on 7th March. Here are some images from the Seminar in 2014. 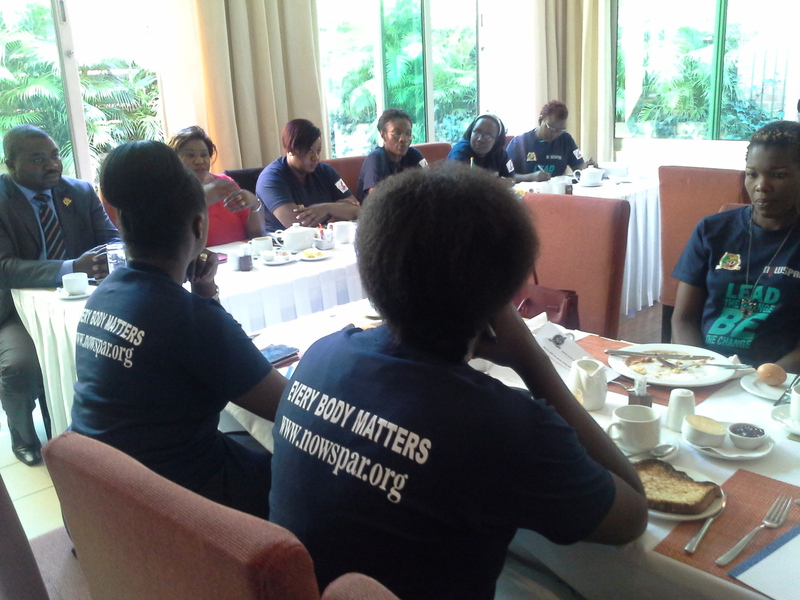 The Women Sport Leaders Breakfast Seminar was held on Saturday 18th October to highlight issues around Women’s participation in leadership in sport as Zambia commemorates its 50th Anniversary. The Seminar reflected on the sport sector in Zambia and its engagement with women and leadership from the perspectives of Policy, Practice and Advocacy. This Seminar was hosted in partnership with the National Sports Council of Zambia. The panel consisted of Ms. Pumulo Mundale- Ministry of Gender, Ms. Doris Mulenga- Ministry of Sport, Dr. Lwatula- National Sports Council, Ms. Matilda Mwaba- NOWSPAR, Mr. Alfred Foloko – Zambia Judo Association. Panelists discussed personal experiences of leadership in sport, policy frameworks and the issues around the practical implementation with the various sport structures and levels. NOWSPAR Executive Director and IWG Africa Representative Ms. Mwaba shared her story of sport leadership highlighting the need fro determination, foresight, diligence and resilience to stay in the arena despite personal and professional challenges. Delegates raised the importance of recognising and profiling women in sport over the years in order to ensure we are part of the documented history of Zambia. Some women in sport who were mentioned for celebration include; Hilda Edwards, Matilda Mwaba, Beatrice Chikonde, Beatrice Mali, Nora Mailwe, Lydia Nanyangwe and Mirriam Moyo. The delegates made a wish list for what they would want celebrated during Zambia’s 100th Anniversary emphasising that the work starts now and that each one had a personal and collective responsibility to make things better. The Seminar closed with dancing and jubilation as is fitting for a Golden Jubilee celebration! 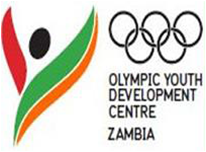 The Olympic Youth Development Centre (OYDC) is a mufti-purpose sports and education complex established in partnership between the Government of Zambia and the International Olympic Committee IOC) and the National Olympic Committee of Zambia (NOCZ). The OYDC runs programs including athlete and technical sport development and social programs including health and rights awareness for children and youth. NOWSPAR was part of the consultative meeting held on Saturday 29th September at the OYDC at which discussions where held on the current programs and operations and opportunities for cooperation. One key result area of the OYDC is ensuring access to sport and social development programs of girls and women by contributing to opportunities for athletes, coaches, peer leaders and technical staff. NOWSPAR will be supporting the delivery of some leadership and sport activities for girls and young women at the OYDC. Also present at the meeting were National Sport Associations, the National Olympic Committee and the Ministry of Sport. Read more about the OYDC and their programs, events and facilities here.